Welcome to the world of hydroponics, the art of soilless gardening. Hydroponics and plant grow lights are the gardening tools for the 21st Century. They make gardening, a year round hobby and literally mean you can grow any plant, anytime, anywhere. You will be amazed at the results you can achieve using the range of products that are supplied from HydroGarden, this includes everything from hydroponic systems, plant grow lights, growing media, plant feeds, plant nutrients along with testing and monitoring equipment to ensure the perfect growing environment is maintained. Increased yields, faster growth rates and year round gardening are just a few of the benefits from gardening this way. Since 1996 the staff at HydroGarden have been using and searching for the best products from around the world and this website brings their knowledge together to enable you to achieve maximum results with minimum effort. So what are the benefits of growing hydroponically? There are numerous reasons why more and more people around the world are growing plants using hydroponic techniques. With the continuing concerns about the level of pesticide and herbicide residues remaining in bought produce, the only guaranteed way to ensure healthy eating is to grow your own. With the self watering and rapid growth rates achievable in soilless gardening, this is now more possible. When you grow hydroponically there is no digging, weeding or soil borne pests or diseases to ruin your enjoyment of clean, easy and productive gardening. There is no need to worry about fluctuations in the weather such as too much rain, frost or not enough sunlight. You are in control and you can achieve amazing results. Please ask your specialist Hydroponic retailer for any advice relating to the products contained within this web site. Our equipment is stocked by all leading hydroponic stores around the country. Go to the retailer locator to find your nearest specialist retailer. All plants have the same basic needs of light, food in the form of nutrients, carbon dioxide (CO2), water, heat and fresh air. 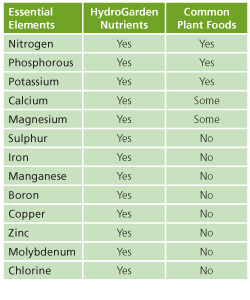 If plants are not given enough of these essential elements then it will not grow or will have problems growing. Different plants require these elements in differing ratios but they are all needed whether the plant is in the soil or grown hydroponically. When you grow hydroponically you can control and enhance all of a plant's basic needs and you even have the ability to ensure adequate Oxygen is available to the roots. This all helps to grow big strong plants with excellent crops and fantastic yields. Hydroponics, by its most simple definition, is the growing of plants without soil. The plants are supported in an inert media such as perlite, vermiculite, clay pebbles, or rockwool and are fed a nutrient solution. This means that the plants do not have to develop a large root system in order to feed. Soil based plants divide their energy evenly between growing upwards and growing downwards (rooting). A hydroponically grown plant expends a greater proportion of its effort growing upwards because all the nutrients it requires are readily available. With the plant having all nutrients available, the plant benefits from having quicker growth and, in the case of crop bearing plants, higher yields. Furthermore, hydroponically grown plants are healthier and more robust than their soil grown counterparts and when grown at home fruit and vegetables taste superior to those found in supermarkets. Under the right conditions a hydroponically grown plant will grow between 2 to 4 times more quickly than in soil. For tomatoes commercial growers have realised yields per hectare of up to 40 times that of soil grown plants. Due to environmental concerns regarding the reduction of water consumption and the worries over the indiscriminate use of nitrates and other fertilisers, herbicides and pesticides in soil based agriculture, hydroponic methods of cultivation are increasing in popularity. The Hanging Gardens of Babylon used hydroponics and the US Army used the technique to feed soldiers during WW2 on the Pacific Islands. Today soilless gardening is rapidly expanding throughout the world and hydroponic installations can be found in all corners of the globe from Australia, the USA, New Zealand, Spain, Holland, Israel, Thailand and the UK. Many of the commercial growers around the world grow produce such as lettuce and tomatoes on a huge scale utilising hydroponic techniques. Commercial crop growers have been using hydrotropic techniques for many years. The speed of growth combined with the control over the growing environment means higher quality crops. The worry about soil borne pests and diseases are reduced dramatically, and weeding is a thing of the past. For commercial growers rapid harvests and higher yields are great reasons to grow this way. The techniques used by commercial growers are now available to the home gardener. All of our systems give you the advantages of commercial style hydroponics in easy to use kits and nutrients. All you need to add are seeds and water. Setting up a system is quick and easy and once running, maintenance consists of monitoring the nutrients and periodically adding more nutrients and water. The system does the hard work for you! You spend the time literally enjoying the fruits of your labour. Hydroponic techniques have been tested by NASA to feed astronauts on long space flights with fresh vegetables; even lettuces are grown on submarines using these techniques. Due to the different sizes and types of systems available means you can grow in any location where there is sufficient light. As the systems are self contained and clean, they can be used indoors such as in a conservatory, greenhouse, cellar, attic, garage or kitchen. Because there is no messy soil and the systems are usually quite light in weight, any indoor location is suitable. They can even be moved outside in the summer. Add a plant grow light and you can grow literally all year round. Easy, clean and productive, you can enjoy fresh herbs and produce even when it is cold and raining outside. By altering the time grow lights are on you can simulate winter or summer day lengths, enabling the plants to fruit or flower earlier or later in the season. You are in control. Active systems, where the nutrient is given to the plant by some automatic means, usually using a pump. Growing using the pot culture method is the cheapest and simplest means to grow hydroponically and is ideal for beginners. Simply fill a suitable pot with a soilless medium and fill a bottom tray or saucer with nutrient solution by hand. The nutrient will reach the plant using capillary action. Plants grown using the Ebb and Flow (Flood and Drain)method are often supported in pots, filled with clay pebbles, which are placed into a special tray. The tray is regularly flooded to soak the clay with nutrient solution and then it is allowed to drain back into a holding tank. This cycle is repeated several times a day. When the nutrient drains away fresh air and oxygen are drawn to the root zone of the plants. Growing using the Ebb and Flow (Flood and Drain)method is an efficient and easy to manage method of soilless gardening. The nutrient solution fed to the plants by simply re-circulating the solution around the system with the roots bathed by a constant flow of nutrient feed. The system is easy and quick to install and provides fast growth rates. These systems are usually run on a constant basis (during daylight hours) which means that the management of NFT systems has to be more diligent that other types of systems. Should the re-circulating pump fail, the plants will die due to the lack of growing media to hold water and food for the plants. However, if managed correctly, this system will outperform all other system types currently available. Growing using theAeroponics method involves suspending the roots of the plants in a darkened sealed chamber. The nutrient is fed to the plant's roots in the form of a 'mist' which contains the nutrients. Due to the high oxygen levels in such a system, rapid growth rates can be achieved. As with growing using the NFT (Nutrient Film Technique), it is important to ensure that the system is monitored and maintained in order to ensure nutrient is being fed to the plants. When plants are grown using the drip irrigation method, a reservoir of nutrient is pumped via drippers to plants usually supported in pots, rockwool cubes or rockwool slabs. The excess nutrient may then be re-circulated or allowed to drain away which is known as 'run to waste'. Use this excess nutrient to feed to your soil based plants! As an alternative you can use the drip irrigation method to feed plants which are placed into individual pots that are filled with either coco coir or clay pebbles. All active systems will need to be maintained and monitored. There are 2 factors that need to be monitored. Different plants need differing strengths of nutrient mixes through the growth cycle, especially if fruiting or flowering is to occur. To measure the strength of a solution a CF (Conductivity Factor) or EC (Electrical Conductivity) meter is needed. CF or EC is the measurement of how much dissolved nutrient is contained within the solution. The higher the number the stronger the nutrient solution is. In general, leafy vegetables like lettuces will need a weaker strength solution than a fruiting or flowering plant, such as peppers, tomatoes or roses. When growing using hydroponic methods, the plants are grown in an inert media and the plant's nutrition is supplied from the nutrient mix. In fact a plant obtains only 25% of what it needs through its roots, the other 75% comes from the air in the form of Carbon Dioxide (CO2). The nutrients and water mix you use in hydroponic growing are the sole source for a number of mineral elements, it is important that you use nutrients that are made for hydroponics and that the water is good quality - tap water is usually fine. This means that nutrients are a key factor in hydroponic growing. A complete and balanced formula is needed to obtain the best results from your chosen system and for your plants. In soil based gardening it is impossible to know how little or how much of a particular mineral is available to the plants. In hydroponics we must provide ALL the minerals necessary for successful plant growth. We therefore use feeds that contain all of the 14 essential minerals required. For these reasons ordinary soil based garden plant foods are unsuitable for use in hydroponic systems. However, hydroponic nutrients are especially good for use on soil based plants due to the complete feed they represent. In general there are 2 types of nutrients available to the hydroponic grower - a 'Grow' nutrient and a 'Bloom' nutrient. The 'Grow' nutrient is used for young plants, plants in vegetative growth and for plants which do not flower or produce blooms or fruit. The 'Bloom' nutrient is used for flowering and fruiting when necessary. Some nutrients are also supplied in a Hard Water and Soft Water formulation. In the UK most of our water is termed as being 'hard' and as such contains high levels of bicarbonates. In these circumstances it is better to use a hard water mix which has less of the minerals that are already found in the 'hard' water. All of the nutrient brands supplied by HydroGarden contain everything that a plant requires in exactly the right ratios to obtain maximum results. All the nutrients are mineral elements that are water soluble so as to be readily available to the plants in the system. HydroGarden offers a complete range of nutrient formulations. This includes single pack nutrients whereby the complete nutrient is contained within one bottle or pack, twin packs, where each 'grow' and 'bloom' nutrient is supplied in an A and B pack separately through to nutrient ranges that perform specific functions at each stage of the plants growing cycle. In any soilless gardening system that uses a media its purpose is solely to anchor the roots and hold moisture/nutrients for the plant. The media itself is inert and contains no plant nutrients. Made of various inert materials it will not decompose, nor harbour any soil borne pests or diseases. The plant's complete nutritional needs are met by the special nutrient mixes that you add to the individual system. We offer a range of growing media that have been selected due to their high quality and superior capacity for holding nutrient solutions, while still retaining a good balance of oxygen and moisture. Clay pebbles are special kiln fired clay based aggregate that is super heated and formed into small 'marbles' usually between 4mm to 16mm in diameter. The inner core structure is porous and will absorb and release nutrient and water to the plants as required. This media will not compact and ensures excellent aeration for the root zone. Clay pebbles can be reused if thoroughly washed. 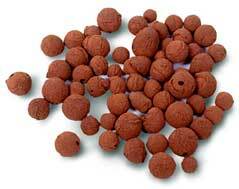 Clay pebbles are an excellent medium for pot culture, to mix with coco coir and for use in Ebb & Flow systems. It is especially popular with Orchid growers. Clay pebbles will readily accept transplanted seedling started in rockwool or any other traditional planting mix. Coco Coir is rapidly becoming the media of choice for both soilless gardeners and soil based gardeners who are concerned about the depletion of rare peat bogs in the world. Coco Coir is a waste material derived from the processing of coconuts and is 100% renewable. Coco Coir has usually been pre-treated or washed to eliminate the high level of salts often found in the raw material. Rockwool is made from molten basalt rock spun into a dense candy floss like material. Rockwool is a popular medium used by hobby gardeners and commercial growers alike. The material is available in small starter cubes for propagating seeds or cuttings, through to large slabs in which plants will happily grow to full maturity. Rooting sponges are an excellent growing medium specifically for medium for taking cuttings or growing from seed. Easy to use, with great aeration properties, rooting sponge grown plants can be transplanted into any system with minimum transplant shock. Rooting sponges are an environmentally friendly product which is biodegradable! They are made from composted organic materials which are held together using a special water based polymer that ensures just the right amount of moisture is maintained. Other media that are often used in hydroponics include Sand, Gravel, Vermiculite and Perlite. In fact any media that is inert and pH neutral can be used, but other issues such as compaction and air to water ratios are very important to consider. Light is the most important environmental factor to consider whether growing in soil outside, hydroponically inside or in a greenhouse. Depending upon where you live and where you want to grow, the sun will not always be there for you. With plant grow lights you can grow any plant, anywhere, at anytime! HydroGarden provide a wide range of grow lamps, reflectors, ballasts and accessories.